Lobster sit a crate at the Stonington Lobster Co-op dock in 2014. State officials say the value of all lobster landed in Maine in 2016 increased by more than $30 million from 2015, hitting a record total of $533 million. ROCKPORT, Maine — The dockside value of statewide landings of lobster jumped by more than $30 million in 2016, hitting a record level of $533 million. It is the second year in a row that the statewide lobster fishing fleet, which consists of thousands of independent owners and operators, cumulatively grossed more than half a billion dollars for their catch. Revised figures for 2015 that were released Friday indicate that the fleet earned $501 million for their statewide haul that year. When factoring in dividends paid to lobster fishing co-op members at the end of the year, Maine lobstermen are estimated to have earned $547 million for their catches in 2016. Overall, Maine’s commercial marine fisheries grossed more than $700 million last year. 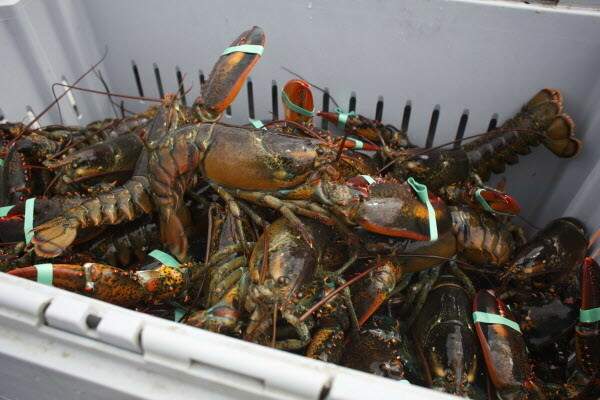 The 2016 statewide lobster harvest also is the first to surpass 130 million pounds, and it’s the fifth year in a row that lobstermen caught more than 120 million pounds, according to DMR. On average, lobstermen were paid $4.07 per pound for their catch in 2016; it’s the second consecutive year it has held at more than $4 per pound. Maine lobstermen averaged more than $4 per pound from 2004 through 2007 but saw their prices dip toward $2 per pound in 2012 before it rose back up over the past few years to $4.09 in 2015. Atlantic herring passed softshell clams as the state’s second most valuable fishery in 2016. The statewide value of herring landings was $19,019,337 last year, up more than $5 million from its 2015 value, even though the volume of the harvest declined by nearly 11 percent. The increase in value reflects the fact that demand for herring, which is the primary type of bait used by lobstermen, far outpaced the supply, DMR officials said. The value of Maine’s Maine’s softshell clam harvest was $15,656,386, representing a reduction in value of more than $7 million from the year before. The harvest volume dropped by nearly 400,000 pounds, from nearly 1.9 million to 1.5 million, while the average price paid to clam harvesters decreased from $2.46 to $2.13. DMR officials cited a biotoxin outbreak and the resulting closure of harvest areas between Mount Desert Island and the Canadian border for the reduction of the clam harvest. The value of Maine’s elver landings rose by $2 million last year, from $11.4 million the year before to $13.4 million, making it Maine’s fourth most valuable fishery. The per-pound average paid to elver fishermen — the highest such average in the state — was $1,430, down from an average of $2,171 per pound in 2015. The volume of the elver harvest rose 4,200 pounds, from 5,400 to 9,400, which is a couple of hundred pounds shy of Maine’s 9,688-pound annual elver catch limit. The value of Maine’s rebounding scallop fishery also held up, setting another record for the average price paid to fishermen. That per-pound price was $12.77 in 2016, marking the seventh year in a row it has increased and the sixth year in a row it has exceeded $9 per pound, which it had never done before 2011. Maine scallop fishermen collectively harvested 537,000 pounds of scallop meat last year and sold it for $6.8 million, representing modest increases for volume and value.